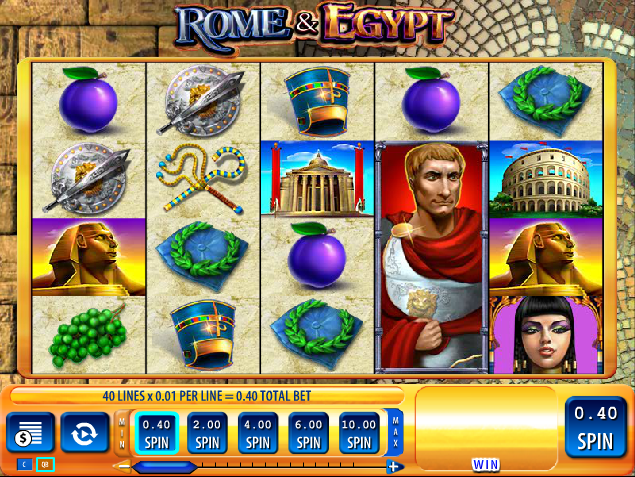 Rome & Egypt is a new online slot machine from WMS Gaming and one which celebrates these great ancient empires; they co-existed of course and most people will be aware of the connections between the two, particularly the relationship between the Roman principal Julius Caesar and the Queen of Egypt, Cleopatra. There’s no real narrative to speak of with this slot but feel free to use your imagination to create one; it has five reels, forty paylines and four rows of reels rather then usual three. Some of the Roman and Egyptian features are quite subtle – look behind the reels and you’ll see Roman mosaics to the right and Egyptian brickwork to the left. All the symbols are related to the theme so on the Roman side we have a bunch of grapes, a sword and shield, a wreath, a Roman temple and the Coliseum; Egyptian symbols are a plum, Cleopatra’s staff, ornamental headwear, the Sphinx and the Pyramids. There are two bonus symbols, Julius Caesar and Cleopatra and they are both wild; they also trigger the bonus feature. As well as triggering the bonus feature, Cleopatra and Caesar are both stacked when appearing in the base game; this means that they can occupy more than one space on the reels and, if you’re lucky, the entire reel. Of course this means more chance to create winning combinations. The more the better of course but not surprisingly the lower numbers of free spins are triggered more often. All wins are doubled during this feature and it’s possible to add more spins to the total but landing more wilds. Paylines are fixed so you’ll always be playing with maximum lines; the free spins are triggered fairly regularly so increase your stake a little to take advantage of that. While we’d like to see a little more in the way of bonus features this is still an engaging slot which pays out small but regular wins. We do particularly like the stacked wilds.